The microservices architecture is emerging as an important approach for distributed mission-critical applications. In a microservice-based architecture, the application is built on a collection of services that can be developed, tested, deployed, and versioned independently. In addition, enterprises are increasingly realizing cost savings, solving deployment problems, and improving DevOps and production operations by using containers. Microsoft has been releasing container innovations for Windows and Linux by creating products like Azure Container Service and Azure Service Fabric, and by partnering with industry leaders like Docker, Mesosphere, and Kubernetes. These products deliver container solutions that help companies build and deploy applications at cloud speed and scale, whatever their choice of platform or tools. Docker Containers are becoming the de facto standard in the container industry, supported by the most significant vendors in the Windows and Linux ecosystems. (Microsoft is one of the main cloud vendors supporting Docker.) In the future, Docker Containers will probably be ubiquitous in any datacenter in the cloud or on-premises. 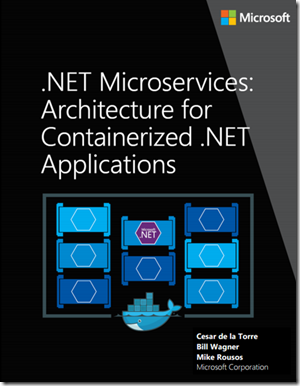 Today, coinciding with /BUILD 2017, we’re excited to introduce you a first edition of an eBook that offers guidance on those mentioned subjects and from our perspective from the .NET team: .NET Microservices: Architecture for Containerized .NET Applications. In addition to the .PDF eBook, it is also available as online version (online web pages) at docs.microsoft.com, so you can directly go to specific pages of the content, as a reference. The best thing about this approach is that you can comment on every page and since it is based on GitHub, you can even submit Pull Requests with content updates that we can approve and merge. This guide is an introduction to developing microservices-based applications and managing them using containers. It discusses architectural design and implementation approaches using .NET Core and Docker containers. To make it easier to get started with containers and microservices, the guide focuses on a reference containerized and microservice-based application that you can explore. The sample application is available at the eShopOnContainers GitHub repo. This guide provides foundational development and architectural guidance primarily at a development environment level with a focus on two main technologies: Docker and .NET Core. Our intention is that you read this guide when thinking about your application design without focusing on the infrastructure (cloud or on-premises) of your production environment. You will make decisions about your infrastructure later, when you create your production-ready applications. Therefore, this guide is intended to be infrastructure agnostic and more development-environment-centric. We wrote this guide for developers and solution architects who are new to Docker-based application development and to microservices-based architecture. This guide is for you if you want to learn how to architect, design, and implement proof-of-concept applications with Microsoft development technologies (with special focus on .NET Core) and with Docker containers. You will also find this guide useful if you are a technical decision maker, such as an enterprise architect, who wants an architecture and technology overview before you decide on what approach to select for new and modern distributed applications. • An identity microservice, which uses ASP.NET Core Identity and IdentityServer. • A basket microservice, which is a data-driven CRUD service that uses Redis Cache. • An MVC watchdogs web app to query and show info from the Health Checks (not shown in the above architecture diagram). As a summary and key takeaways, the following are the most important conclusions from this guide. Domain-driven design and SOA. The microservices architecture patterns derive from service-oriented architecture (SOA) and domain-driven design (DDD). When you design and develop microservices for environments with evolving business rules shaping a particular domain, it is important to take into account DDD approaches and patterns. CLI versus IDE. With Microsoft tools, you can develop containerized .NET applications using your preferred approach. You can develop with a CLI and an editor-based environment by using the Docker CLI and Visual Studio Code. Or you can use an IDE-focused approach with Visual Studio and its unique features for Docker, such as like being able to debug multi-container applications. Resilient cloud applications. In cloud-based systems and distributed systems in general, there is always the risk of partial failure. Since clients and services are separate processes (containers), a service might not be able to respond in a timely way to a client’s request. For example, a service might be down because of a partial failure or for maintenance; the service might be overloaded and responding extremely slowly to requests; or it might simply not be accessible for a short time because of network issues. Therefore, a cloud-based application must embrace those failures and have a strategy in place to respond to those failures. These strategies can include retry policies (resending messages or retrying requests) and implementing circuit-breaker patterns to avoid exponential load of repeated requests. Basically, cloud-based applications must have resilient mechanisms—either custom ones, or ones based on cloud infrastructure, such as high-level frameworks from orchestrators or service buses. – Microsoft Platform and Tools for Mobile App Development. 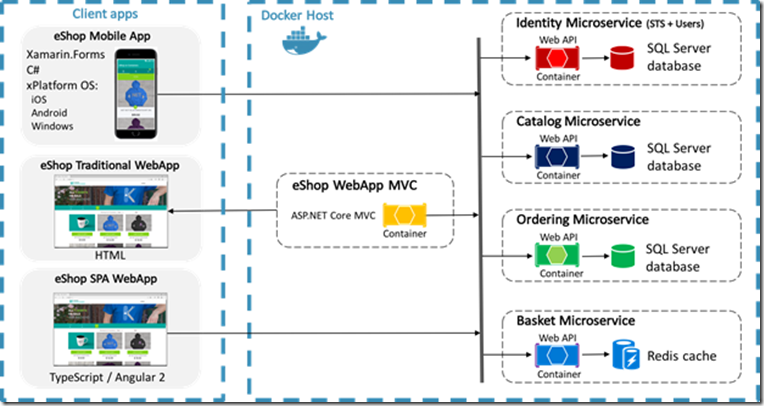 We wrote this guide to help you understand the architecture of containerized applications and microservices in .NET. This guide and its related application will be evolving, so we welcome your feedback in order to improve it! If you have comments about how this guide can be improved, please send them to: mailto:cesardl@microsoft.com Also, feel free to post your comments within this blog post, of course. We’ll appreciate your feedback and ideas on how to improve this content.